You know how they say that you spend one-third of your life sleeping? Well, a dog probably spends even more time on this pleasurable activity, or so it seems at least. It’s important for them to be comfortable and for their beds to be of high quality, allowing them to get a good rest. Below, you will find information on five of the best dog beds that you will find in 2017, products of the highest quality. You will get both cheaper and more expensive products, depending on the budget that you’re working with. If money is no issue, then you have the best bed in this category, the Big Barker Orthopedic Dog Bed. If you’re just looking for the best bang for the buck, then you can choose something like the Coolaroo elevated pet bed. This dog bed comes in three versions, Large, Extra Large and Giant, so choose depending on the size of your dog. It’s not the cheapest product on our list, sold at $350 at the moment, but then again it’s the best one that we’ve reviewed. Pros – the bed has three layers of support, and it has a total of 7 inches of foam of the highest quality. The cover is made out of microfleece, and you can wash it as often as you need to. It can be used for large breeds and for dogs which have mobility issues. Cons – it’s not a cheap product and it can’t be easily found in pet stores, but it is easy to find online. You might need an additional liner bag so that you can protect the cushion from moisture. 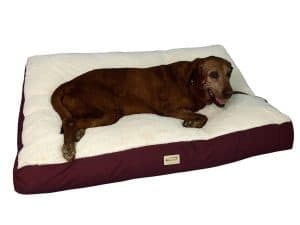 Conclusion – it might be more expensive, but it’s also one of the best dog beds that you can find right now, one of the few with three different layers of cushioning provided so that the therapeutic support is maximum. It’s easy to maintain and overall larger breeds will love it. This is a product that is made in the USA, and which uses 5” thick foam. It’s supportive gel memory foam, covered by a removable cover which is made out of 100% cotton. It also has a waterproof encasement. There are versions designed for small, medium or large dogs. It’s a cheaper product than the previous dog bed, available at $140. A total of 11 stylish covers are offered, and you can choose the one that you prefer when you buy the dog bed. Pros – the design has a total of four layers, with gel foam which makes it a good choice for your pet. The stylish covers come in quite a few versions, so you can choose one that you like or which looks good in your house. Versions for dogs of all sizes are available. Cons – the layer of gel foam doesn’t breathe that well and could retain heat inside. The bed’s bottom can slip on the floor if they’re made out of wood. Conclusion – it’s a good quality product, which gives older dogs a bit of warmth and the support that they need. The owners are not forgotten either since there are 11 different stylish covers to choose from. 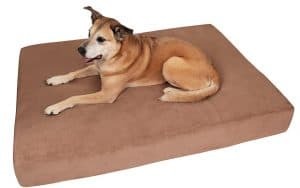 Sold for $80, the pet bed offered by Armarkat is made out of heavy duty canvas and with soft plush, while the base is skid free and waterproof. It has a zipper opening, so you can remove the waterproof lining, in order to clean it. It’s a product that works well for larger dogs and only comes in one size. Pros – the outer shell is made out of canvas and it has a base that doesn’t skid around, so it’s safe to use. The inner layer is made out of soft plush, so it’s very comfortable to use, even more so than the memory foam. It’s good for the larger breeds. 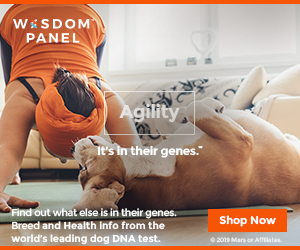 Cons – it’s not an orthopedic model, so while it may be comfortable it is not as good for your dog as some of the others that we talk about. The cushion is not waterproof, so liquids that might get into the bed will go right through it. Conclusion – it is a very soft bet, and some dogs will like that, but it doesn’t give them as much support as other beds. Young and healthy dogs are the better users for this bed since they don’t need orthopedic support yet. The Coolaroo Elevated Pet Bed is the best bang for the buck product that we have on our list. It comes in four sizes, from Small to X-Large, so it is fit for use for dogs of all sizes. 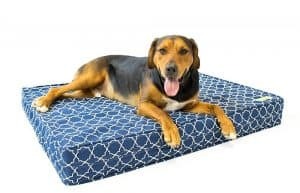 It costs less than $30 as of the moment of this review, and if you have a small budget then it will be a good choice for your dog’s bed. Pros – it has rubber feet for its steel frame, and it is fairly stable on your floors. The pet is elevated into the air and it has a breathable material for the dog to sit on, so he’s cooled and the air circulates well. It offers good support in the long run, while foam mattresses don’t do that in the long run. Cons – a bit of assembly is required. The fabric used might see some scratching from the dog, or some chewing, in which case the life will not be too long for it. 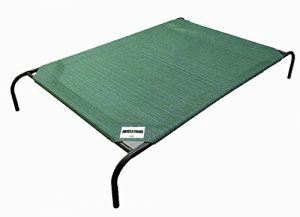 Not all dogs will want to use this type of elevated dog which resembles a trampoline, and there is very little padding offered. Conclusion – the price of the bed is surprisingly small, and in exchange it will offer good support and ventilation, while missing the mark on providing heat retention, which others will have. Another product that is on the cheaper side, going for prices of up to $33, depending on the size. It has about eight different versions, ranging from 18 to 48 inches. A lot of clients are satisfied with this type of dog bed, which fits well inside dog crates and which can also be used as a bed on its own. It’s made out of synthetic fur that is very soft, and it has a bottom surface with a non-skid grip. Pros – it’s mainly designed to give pets a bit of comfort when they’re in various types of enclosures (kennels, crates, etc). Thanks to the non-skid bottom it will not move around. It’s entirely washable in the machine and quite comfortable. There are different sizes offered, so most dog sizes are accommodated. Cons – If the dog enjoys chewing or scratching, the material that the bed was made out of will not last for long. The interior is made from soft foam, and it doesn’t provide a lot of support, not like memory foam does anyway. Conclusion – it’s a good option if your dog enjoys the comfort of a kennel enclosure or crate at night, since it fits well in that kind of space.